2nd Annual Alumni Game on Saturday, April 20th. Open to all ages and anyone who has played for any of the 3 schools. Open to public to come watch. It is a fundraiser for the girls and boys basketball programs. 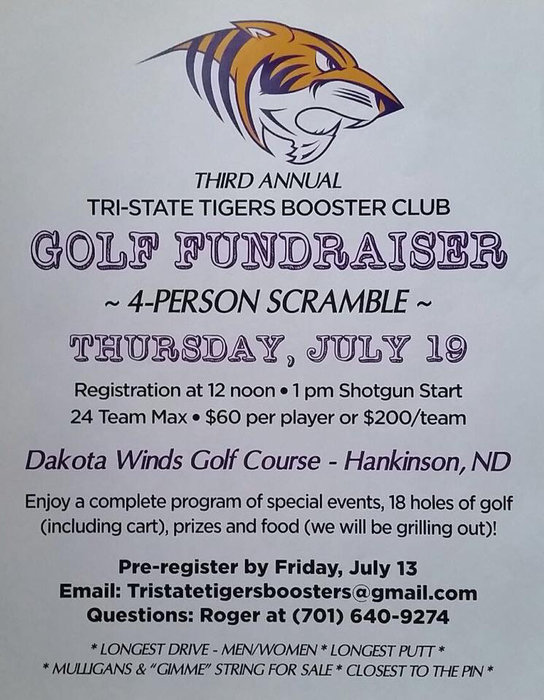 Sign up by contacting Adam Krueger. Track and Field update: We could not get into the Lisbon meet Tuesday, April 23rd. Instead we will be competing in Breckenridge next Thursday. Field events begin at 3:15 and running at 3:30. The Wheaton meet on Tuesday, April 23rd has been postponed to May 13th. I am not sure if we will go on May 13th at this time. We will see what the future holds. The Wheaton JH track meet has been postponed to 5/6. 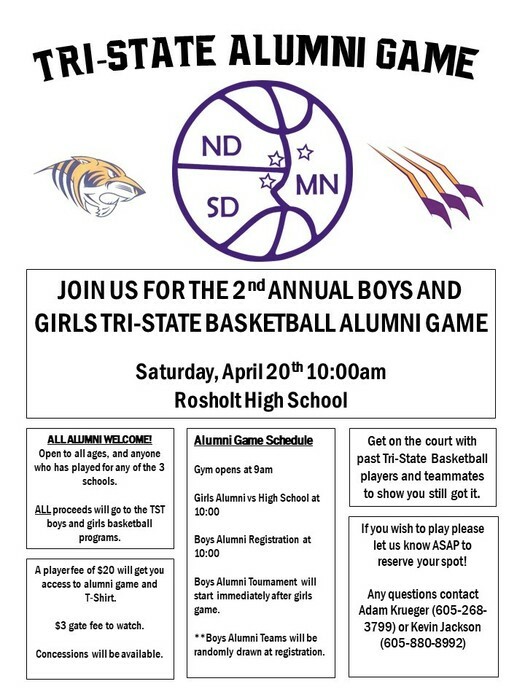 Don’t miss the alumni game next Saturday in Rosholt. It is a fundraiser for the boys and girls basketball programs. Girls start at 10 and boys to follow. We will make teams on Saturday. Come lace up or watch this fun filled afternoon. Please claim your spot as soon as you can. 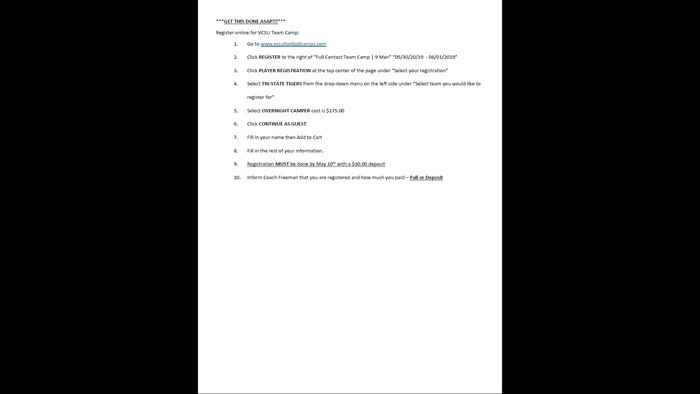 To claim your spot or any questions please contact Adam Krueger or Kevin Jackson. 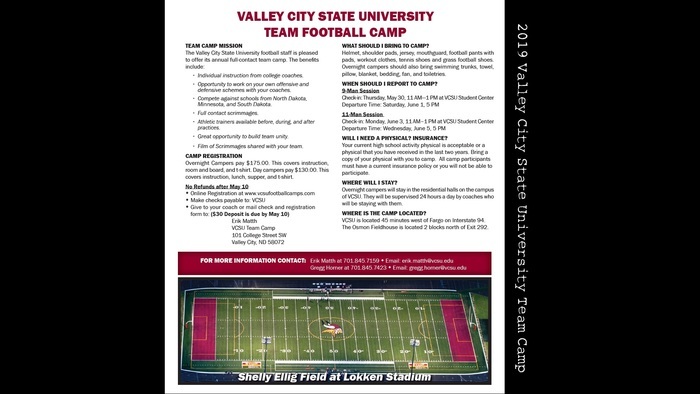 The football team will be attending the VCSU Team Camp this summer from May 30th - June 1st. Please register online as soon as possible. Instructions are posted below along with the camp information. 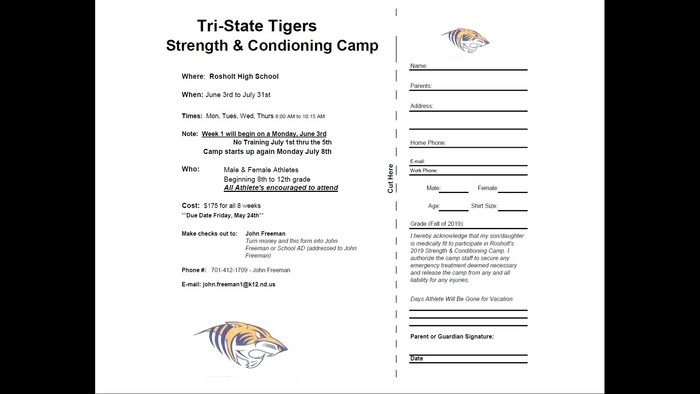 Please contact Coach Freeman for any questions or concerns.Go Tigers! 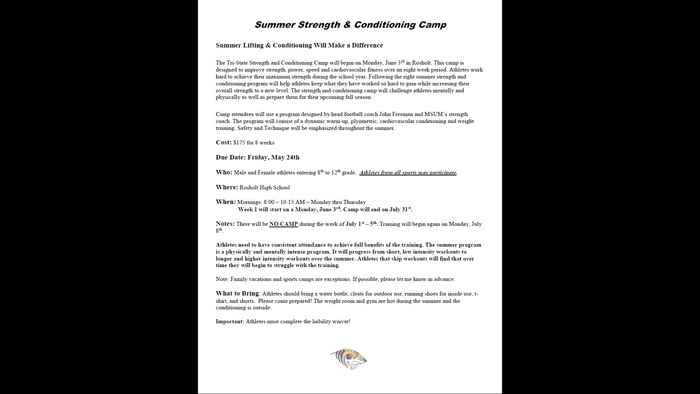 Summer Strength Camp starts on June 3rd. Please see the attached forms for more information.This camp is for ALL athletes. Boys & Girls 8th-12th grades are encouraged to attend. Please return the sign up form to your schools office in a envelope labeled Coach Freeman. Go Tigers! The National Guard Meet in Milbank scheduled for Friday, April 11th has been postponed. The meet in Webster on April 16th has been cancelled. Reminder Warwick Workouts Basketball Camp registration is due May 1st. Get the forms in your school’s office or contact Coach Krueger. There will be a football team meeting next Wednesday April 10th in Fairmount at 2:00. All players going into 9th thru 12th grades need to attend. Going over summer camps. Team camp is coming up fast May 30th-Jun1st. Go Tigers! Track and Field: There is a spur-of-the-moment indoor track meet at NDSU next Friday, April 5th that we will attend. More information can be found on the track website at https://sites.google.com/view/tri-statetigerstrackandfield/home. Tri-State Basketball is bringing in Warwick Workouts to work with boys and girls in grades 7-12. It will be a great opportunity to get better this off season. 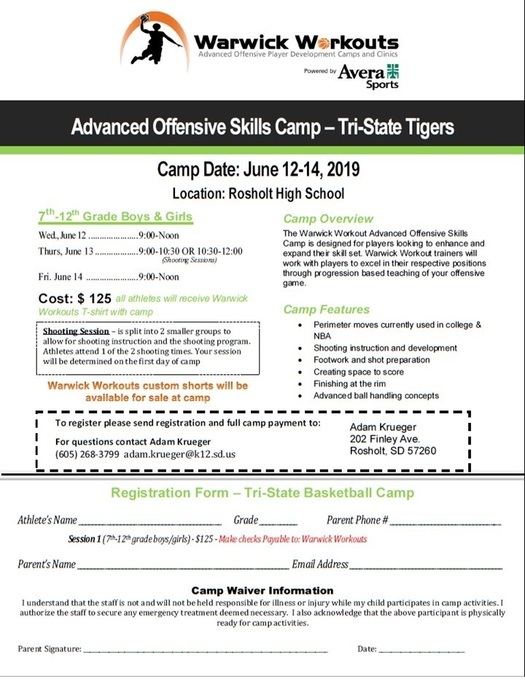 Camp will be June 12-14 in Rosholt. Any questions see the flyer, or contact Coach Krueger. Forms and payment due May 1st. Track and Field athletes: Our team shirt for this year will be #15 on the Fancloth order. You can still use the online site. I will close it at 12:00 a.m. tonight. Track practice Thursday will be in Campbell. No optional track practice today due to weather. Track and Field athletes: The votes are in! Our team shirt for this year will be #15 on the Fancloth order. Tigers 5th and 6th grade game today has been postponed. Practice today will be in Campbell from 4-5:30. TRACK ATHLETES and PARENTS - First mandatory practice is Friday, March 8th in Fairmount. All physicals must be taken care of before practicing. The parent meeting will be online this year. I will post information on that shortly. The Tiger Boys Basketball game will be broadcast on Thunder 106.1 FM starting at 7PM. The audio broadcast will be available at https://www.thunder1061.com/. For a full Region 1 Bracket click the image below. The Tiger Boys Basketball Team will play Enderlin in Enderlin on Tuesday February 26th at 7:00 PM in round one of the Region 1 Boys Basketball Tournament. Come out to cheer on the Tigers Boys! Varsity game only. Having trouble with the live stream. Keep checking back. Hopefully it will get figured out. We will be streaming the JV and Varsity games vs. Wyndmere/Lidgerwood tonight. GO TIGERS!!! Boys Basketball game tonight in Campbell. C-squad starts at 4:45. Bus will leave Rosholt at 3:15 and the bus will swing through and pick up Fairmount kids at 3:30. PRACTICE CHANGE- Today, February 21st, Varsity players will practice in Campbell and JV/C-Squad will practice in Rosholt. Everyone will leave right after school. Any track athletes interested in competing at the Concordia Indoor on March 16th and/or the NDSU indoor March 23rd need to contact Coach Nordquist. You will need to have at least ten practices before competition, which you may start as early as Monday, February 25th. Tonight's Varsity Boys game vs Hankinson will be broadcast on Coach Loll Sports YouTube channel. GO TIGERS!!!! Boys Basketball Schedule- Today: Practice in Fairmount after school Friday: Game @ Lisbon. C-Squad at 4:15. Departure times TBD Saturday: Varsity NDSCS Bonanza. We play Richland at 7:30. GBB Region 1 play in game is tomorrow Feb 14th at Casselton ND, @ 7 pm against Central Cass. Bus will leave Campbell @ 4:15, Fairmount @ 4:35, Rosholt @ 4:30, Lets beat the Squirrels !! Go Tigers !! Due to a water main break in Rosholt, varsity girls practice will be held in Campbell. Boys and girls will ride together leaving at 3:00. Girls play @ Central Cass for the opening round of the Region 1 tournament tomorrow 2/14. Game time is 7:00. GO TIGERS! No JH basketball today. I will let you know if we are going to make it up as soon as I hear. Due to weather the BBB game tonight vs Hankinson has been cancelled. Make up date TBD. 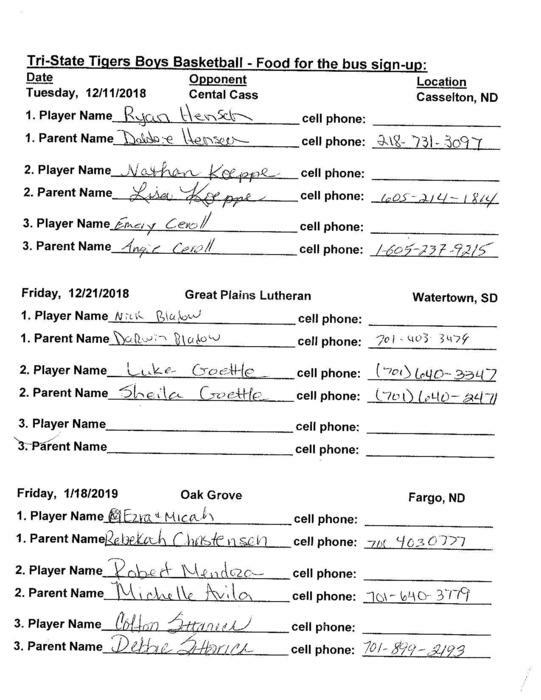 Tomorrow BBB game against Hankinson in Hankinson. There is no c-squad game. C-squad game got canceled. Departure times are still being figured out! Info for JH boys basketball game tues Feb 12 in Wheaton 8th grade will play at 5 with 7th grade to follow. GBB Game Monday Feb 11, against Waverly/South Shore In Waverly, C-game at 5, then JV & Varsity to follow. Bus will leave Campbell @ 2:15, Fairmount @ 2:35, Rosholt @ 3:00 , GO LADY TIGERS ! The JV game will be a 3 quarter game. Wyndmere/Lidgerwood is low on JV numbers. This will cause the Varsity game to start a little earlier than anticipated. Lots of changes for today Tiger Fans. 1. Game vs. Britton-Hecla is canceled and will not be made up. 2. We will be playing Wyndmere/Lidgerwood tonight in Rosholt. This game was rescheduled for Tuesday but we are playing it tonight. JV starting at 4:00 with Varsity to follow. 3. Boys Varsity only practice in Fairmount tonight. 4. No JH boys practice tonight. 5. Pass the word that we will be streaming the Varsity game which will start around 5:20. 6. GBB Parent's day/night will be tomorrow 2/9 in Campbell following the JV game. JV game starts at 1:30. Please help spread the word on all the changes. Thanks everyone and GO TIGERS!!! Jr. high boys basketball will not practice today. We have a game Monday vs brownsvally and Tuesday we go to wheaton. The Tigers Girls Basketball game scheduled for today, Thursday 2/7/19, against Wyndmere/Lidgerwood has been postponed. 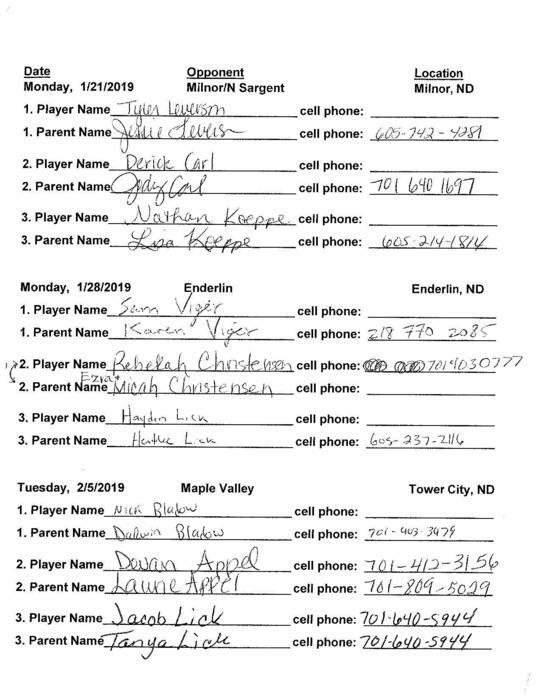 The game will take place on Tuesday, 2/12/19, in Rosholt. The start times will remain the same. Go Tigers! The C-Squad game against Hankinson next Tuesday has been cancelled due to Hankinson being short on numbers. Jr. high boys basketball game schedule changes... Tuesday Feb 5th. 3 games. We start at 4:00 PM vs hankinson . We will play two games with TZ following the hankinson game. All 3 games are in Campbell. Thursday Feb 7th games vs circle of nations has been moved to fairmount. GBB game for tonight vs. Richland has been postponed to Saturday February 9th. JV at 1:00 and Varsity to follow. Parent's night/Parent's day will be announced immediately following the JV game. 9th-12th grade boys basketball practice in Fairmount today after school. GBB game with Florence/Henry will be played in Florence tonight. C- Game will start @ 5 pm, then JV & Varsity to follow. Bus will leave Campbell @ 2 pm, Fairmount 2:20 pm, Rosholt 2:40 pm. Boys Basketball takes on Northern Cass in Fairmount tonight! C-Squad starts at 4:45. Buses will leave Rosholt and Campbell at 3:30. Go Tigers! Jr. High boys basketball game vs TZ for tomorrow 12/31 has been cancelled. We will have practice. Correction, GBB game is tomorrow Thursday Jan 31st not Jan 24th, Sorry! GBB game with Lisbon will be Thursday Jan 24th @ Lisbon. C team will start at 4:45pm with JV & Varsity to follow. Bus will leave Campbell @ 2:20, Fairmount @ 2:40, Rosholt @ 2:30. Go Tigers!! We are bringing our streaming equipment to Enderlin. If we can get on their WiFi, we are going to try stream the JV and Varsity games. Search Rosholt Industrial Technology in YouTube and cheer on the Tigers. Spread the word to others that may want to watch. Jr. High boys basketball games in rosholt today have been cancelled. Also No practice today . GBB practice will be in Fairmont today as scheduled. Bus will leave Rosholt at 3pm. Junior high players its optional. Drive safe, stay warm. Decision has been made! The boys basketball games against Enderlin tonight are still on! Campbell kids will leave at 2:10, Rosholt at 2:20, and Fairmount at 2:30. C-Squad game starts at 4:45. Go Tigers! Good news Tiger Fans. I brought the streaming equipment to Wheaton and it looks like it will work to stream the game. Search Rosholt Industrial Technology in YouTube and cheer on the Tigers. We will start streaming about 2:30. Jr high basketball today in rosholt. We have switch the order of games. 8th grade will play at 5 p.m. and 7th grade will play at 6p.m..
Hello Tiger Fans. We are streaming both the JV and Varsity games tonight vs. Hankinson on the Rosholt Industrial Technology YouTube channel. Tune in and cheer for the Tigers. There will be no C-Squad game on Saturday in Wheaton. JV will start at 1:00pm and Varsity will follow. Reminder: 9th-12th Grade Boys practice in Campbell today. C, JV, & Varsity Boys basketball at Milnor tomorrow night. C-squad starts at 4:45. Bus leaves from Campbell at 2:50, 3:05 from Fairmount, and 3:00 from Rosholt. 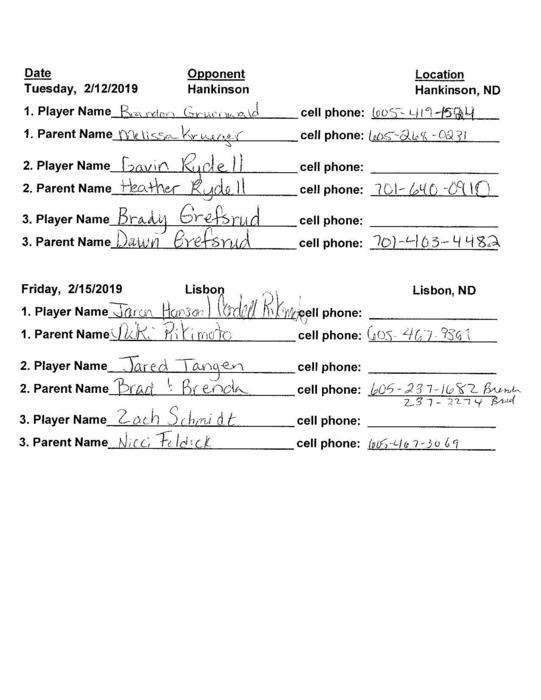 Jr high boys basketball in milnor Monday 1/21. Buses leaving Campbell and rosholt at 2:20 and fairmount at 2:50. GBB practice will be in Campbell Monday Jan.21 not in Rosholt. Change of plans. The varsity game tonight against Oak Grove will be streamed on the Rosholt YouTube channel. Tip off will be about 7:50 pm. Here is the link or search Rosholt Industrial Technology. https://www.youtube.com/channel/UCe7SxxxU3Te73ofLwb2tTUg GO TIGERS! Boys Game tonight at Oak Grove. C-Squad at 4:45pm and JV & Varsity Games to follow. Campbell kids leave at 2:40, Rosholt kids leave at 2:45, and Fairmount kids leave at 3:00. Go Tigers! The game against Northern Cass is streaming on the Rosholt Technologies YouTube channel. GO TIGERS! Good evening Tiger Fans. We think we have the technical bugs worked out and will be streaming tonight's game vs Richland on the Rosholt Industrial Technology YouTube channel. Go Tigers! JV & Varsity game tonight vs Richland at Campbell. JV starts at 6:00pm. Rosholt bus will leave at 4:20 and Fairmount will leave at 4:45. Jr high boys basketball pictures will be taken tomorrow at 3:30 in fairmount. Make sure kids have envelopes and game uniforms. Location change: Tomorrow, January 14th, 9th-12th grade boys will be practicing in Campbell, and Junior High Boys will practice in Fairmount. Monday's GBB games are in Wilmot. JV 6:15 , Varsity to follow. The bus will leave Campbell @ 4:00pm, Fairmount @ 4:25pm, Rosholt @ 4:45pm. GO TIGERS!! Jr high boys basketball will have an eighth grade game in fairmount Friday January 11th at 4:45. Coach Loll Sports is having technical difficulties and will not be able to stream the Varsity game tonight. If Coach Loll Sports has technical issues they will plan on using the Rosholt Industrial Tech YouTube Channel instead. https://www.youtube.com/channel/UCe7SxxxU3Te73ofLwb2tTUg. The bus for tonight's games in Campbell against Hankinson will leave Rosholt at 3:30pm and Fairmont at 3:50pm. GO TIGERS!!! Reminder: Boys basketball game in Rosholt tomorrow vs Waverly/South Shore. No C-team. Jr high plays at 4:45, JV at 6:00 and Varsity to follow! Boys basketball practice for everyone will be in Rosholt tomorrow at 3:40. Rosholt kids can come anytime after 3:15. Campbell and Fairmount kids will leave after school! GBB practice is in Fairmont tomorrow. Bus will leave Rosholt at 3:10pm. GBB Practice today is canceled . Stay home. Boys basketball practice is canceled for today due to weather. Stay warm and stay safe. We will be streaming all 4 games today. Search Rosholt Technologies in YouTube. The two JV games will be 3 quarters each. GO TIGERS! Today's Tigers Basketball double header against Sargent Central is still on as planned from yesterday's postponement.. JV Girls to start at 1 PM, JV Boys, Varsity Girls and Varsity Boys to follow. The bus will leave Campbell Friday 28th @ 11:30am and Fairmount @ 11:50 am for the games in Rosholt. Please remember to turn in raffle tickets to your coaches. Go Tigers!! The basketball double header vs. Sargent Central scheduled for 12/27 is being postponed to Friday 12/28. All times will be the same. JV Girls at 1:00, JV Boys, Varsity Girls and Varsity Boys all to follow. Stay safe and warm. GO TIGERS! Holiday GBB Schedule Dec. 22, 8am @ Rosholt Leave Campbell 7:15am , Fairmount 7:30am, Dec 26th , 7:30 am to 9:15 am. @ Rosholt, Dec27th Game in Rosholt, 1pm JV Girls, 2pm JV Boys, 3pm VG, 4:30 VB, Dec. 28th, 8am @ Fairmount, Dec. 31st, 8:30 am @Rosholt, Jan 2nd, @ Campbell, Leave Rosholt @ 3:10, Fairmount @ 3:30pm Happy Holidays! Jr high boys basketball practice in rosholt today at 4 p.m.
Great effort tonight from all three teams. Reminder tomorrow is the ECC JV/C-Squad Jamboree. Bus leaves from Campbell @ 7:30, Fairmount @ 7:45, and Rosholt @ 8:15. No need to dress up and make sure to bring your practice jersey. Here is the list and dates from the Parent Food Sign Up Sheet. This is very helpful and greatly appreciated. We have the best parents around! 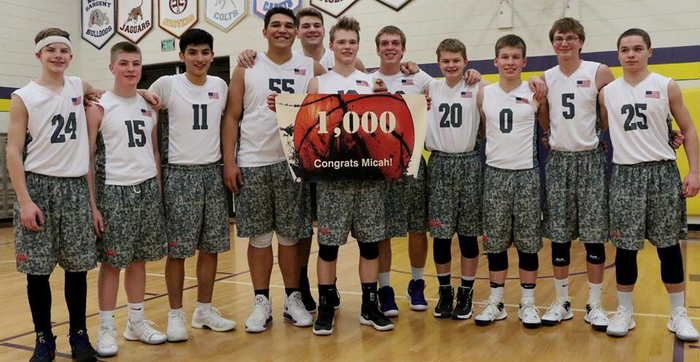 ECC Boys Basketball JV/C squad Tourney is Saturday Dec 15th in Summit SD, Leave time in Campbell is 7:30am, Fairmount is at 7:45am, Rosholt is at 8:15am First game time is at 9:50am, Players bring your practice jerseys. ECC Girls Basketball JV Tourney is Saturday Dec 15th in Florence SD, Leave time in Campbell is 6:45am, Fairmount is at 7am, Rosholt is at7:25am First game time is at 9:50am, Players bring your practice jerseys and wear black shorts. Jr high boys basketball open gym in Campbell today from 3:30-5. This is for players that need makeup practices. Transportation will not be provided. 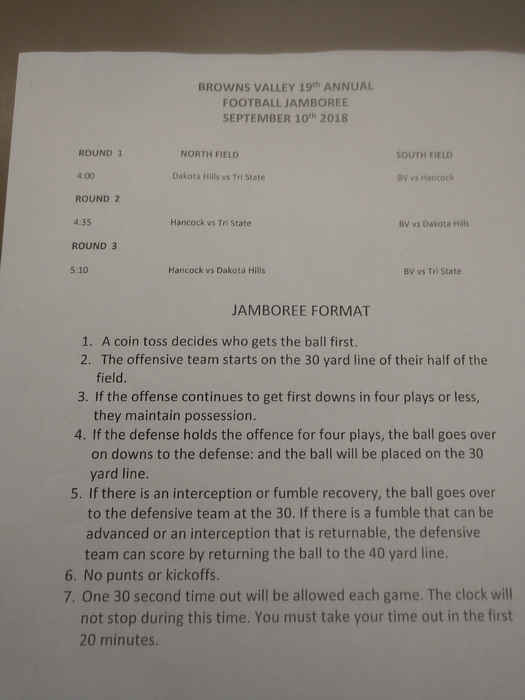 Schedule for Saturday’s JV/C Squad Jamboree. Leaving times are still to be determined. Reminder: jr high boys basketball starts today in fairmount. Rambow Fan store update: Shipment has not arrived in Campbell or Fairmount yet. Will be there tomorrow or the next day! Stay tuned and you will be notified when it arrives. Sorry for inconvenience. Basketball Rambow Fan Store items are in. Check in the school office where you had it shipped. If you get your order and if there is something missing, it got back ordered and will be here as soon as they get it in. Any questions ask Coach Krueger. Thank you! Boys Basketball practice today after school in Fairmount. No C-squad practice today. Everyone start selling your tickets. If someone wants to write a check have them write it to “Tri State Basketball”. Reminder that Thursday our 7th graders will begin at 6:00 p.m. with the 8th grade game to follow. GBB Practice in your home gym tomorrow at 630am. Boys Basketball- Practice tomorrow at 6:30 am at your home school and pictures after school in Fairmount. The Varsity and JV Tigers Girls Basketball games vs. Enderlin on Friday 11/30/18 will be live streamed at https://www.ndsportschannel.com/. You may be able to watch directly from the site or you may be re-directed to ND Sport's YouTube Page. Click the link Friday to watch live. The bus will leave Campbell at 3:10pm , Fairmount at 3:30pm, and Rosholt at 3:15pm for the Enderlin GBB game on Friday Nov 29th. Great efforts by everyone the last game. Time for W on Friday!! Boys basketball practice starts tomorrow!! There will be a practice in the morning and the afternoon. Morning practice will be at your home school at 6:30. Than everyone will have practice after school in Rosholt. Bring goals, shooting chart, and any medical forms you may need. GBB will be having practice Saturday Nov. 24th in Fairmount at 730am. Also practice on Sunday, Nov.25th in Rosholt at 5pm. Team and Individual pictures will be taken that day on the 25th. Practice is in Campbell on Monday Nov. 26th. Beat the Warriors on the 27th!!! Happy Thanksgiving!!! GBB Practice in Rosholt today and tomorrow. No Practice Thursday or Friday. Boys Basketball parent athlete meeting is tomorrow, Tuesday Nov 20th at 6:30pm at Fairmount gym. This meeting is for grades 9-12. Game and practice schedules will be handed out. First morning practice is Monday, Nov. 26th at players home school. Afternoon practice will be in Rosholt for everyone. This is meeting us required and contact Coach Krueger if you cannot attend. Friendly reminder JH GBB will take pictures today and practice is moved to Fairmount today. There will be no girls basketball practice tonight. This includes 7-12. Today's game in Colfax will be 4 quarters at 6 minutes each. Boys Basketball parent athlete meeting is Tuesday Nov 20th at 6:30pm at Fairmount gym. This meeting is for grades 9-12. Game and practice schedules will be handed out. First practice is Monday Nov. 26th in Rosholt. This is required and contact coach Krueger if you cannot attend. JH GBB practice tonight will be in Fairmount instead of Campbell. Girls Basketball parent athlete meeting is Friday Nov 9th at 6:30pm at Fairmount gym. This meeting is for grades 9-12. Game and practice schedules will be handed out. First practice is Monday Nov. 12th in Rosholt. Change in practice JH GBB practice on Thursday will be in Rosholt will be done by 5:45. Varsity girls volleyball, remember to dress up for match tonight. Bus leaves at 5:15 from Campbell and Rosholt, bus will leave Fairmount at 5:30. C and JV girls: remember to hand in your jersey to your school's office. I will pick them up next Thursday. HS Boys Basketball Location Change* Open gym will be in Fairmount tonight at 6:30. Please spread the word. 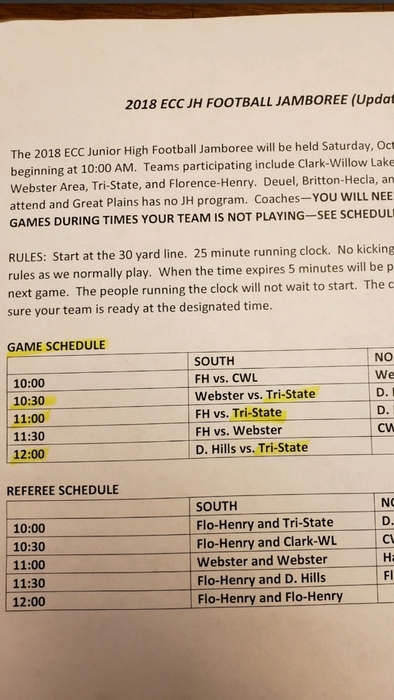 Tri-State Volleyball: Tri-State plays Wyndmere/Lidgerwood on Friday night (Nov. 2nd) for the Region play-in game. The game will be in Lidgerwood at 7:00 pm. Come out and support the girls! Due to Parent-Teacher Conferences, One act play and other sports practices we will have open gym in Rosholt this week. Tuesday at 6:30 in Rosholt, and Thursday at 6:30 in Rosholt. For boys in grades 9-12. There will be an open gym tonight for 9-12 boys basketball players in Rosholt @ 6:30. Reminder there is a boys basketball meeting in Fairmount today at 11:10 if anyone is interested. Campbell and Rosholt will leave at 10:30. Anyone interested in playing must attend. If you can’t make it let Coach Krueger know! There will be a parent/player JH GBB meeting Sunday, October 21st at 7:00 p.m. in Fairmount. The first practice for JH GBB will be Monday, October 22nd. Make sure all physicals are taken care of and basketball shoes are broke in. There is a change to our volleyball practice schedule. Practice wednesday and thursday (Oct. 17 & 18) will be in Rosholt. Wed will be regular time, Thursday bus will leave Campbell at 2:45 and will pick up in Fairmount after that. We will practice that day from 3:30-4:45. No practice Friday, Oct 19. Next week we will practice in Campbell, regular time. We are just switching these two weeks around, no school is losing their practice week! BEK Sports will be broadcasting tonight's volleyball game. Broadcast info can be found at - https://www.bektel.com/bbn/ - though it may only be viewable under ND cable packages. The region cross country meet has changed to Thursday Oct. 11 start time is 10 a.m. Reminder: There is volleyball practice today in Fairmount. Bus leaves Rosholt at 3:10. Reminder of the JH volleyball game that was added versus Wheaton tomorrow night (10/4) in Rosholt. 7th grade game starts at 5:00 with the 8th grade to follow. BEK Sports will be broadcasting tonight's volleyball game at - https://www.bektel.com/bbn/ - though it may only be viewable under ND cable packages. Reminder: Anyone interested in a cancer awareness t-shirt, order forms are due by tomorrow, Sept 26. Orders can be given to Emma or Bobbi Jo Steffens. There is NO C squad volleyball match today. But there will be a Jr High match at 5:00. Varsity and Junior High football practice will be in Rosholt tomorrow after school. There has been a tournament added for C Squad on Saturday, October 13 in Kindred. There will be more info to follow. No JV football game tomorrow. Wyndmere/Lidgerwood does not have enough players for JV. JH as normal. Junior High football beat Richland today 28-20! Great way to start the season! Congrats to the coaches and players! JH and varsity football Practice Monday 9/3 will be in rosholt at 3 p.m. . Bus leaves Campbell at 2 and Fairmont at 2:30 . Tonight's football game vs Britton-Hecla will broadcast on Dakota 105.5 or online at http://www.dakotabroadcasting.com/ Go Tigers! Cross Country meet and JV football for tonight is cancelled. Both teams will have practice in Rosholt at 4:00. Bus from Campbell and Fairmount will leave at normal after school times. Today's JV football game has been cancelled. Practice will be in Rosholt after school. Bus leaves Campbell at 3 and Fairmount at 3:30. Leave times for volleyball matches this week are as follows: Monday- Campbell leaves @ 3 w/football, Fairmount 3:30, meet in Rosholt and leave at 4:45. Tuesday: Camp. leave @ 2:00, Fair. 2:20, Rosholt @ 2:45. Thursday: Same as Tuesday. There will be C-squad matches on Tues and Thurs. Please check the lunch schedule for this week. Volleyball girls, we have yet another change in leave time tomorrow. The bus will leave Campbell at 1:45, NOT 1:30, and the bus will leave Fairmount around 2:00. Practice will still be from 2:30-4:30. Reminder: 8th grade volleyball girls you are invited to join the JV/Varsity practice tomorrow! Bus leaves Campbell at 1:30 and Fairmount at 1:50 - practice will be in Rosholt from 2:30-4:30. You must bring your physical in order to participate! The previous message is for volleyball. Practice time for Monday and Tuesday has been changed due to bus availability. On Monday, bus will leave Campbell at 1:30, Fairmount about 1:50. Practice from 2:30-4:30. Tuesday, bus leaves Campbell at 2:00, Fairmount about 2:20. Practice from 3:00-5:00. The rest of the week is practice as scheduled. Bus leaves Campbell at 3:00, Fairmount at 3:30. Reminder that JH football practice starts on Monday the 20th in Fairmount at 3:30. Bus will leave Campbell and Rosholt at 3:00. Also remember to bring your physicals with you to practice. 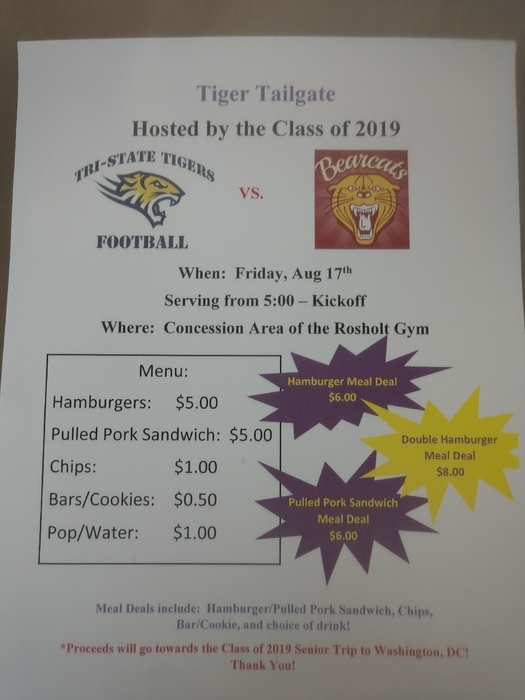 Come support the Senior Class before cheering on our TriState Tigers! 9-12 Volleyball: Practice starts on Monday, August 13, it goes from 12-3:00, in Rosholt. Bus will leave Campbell at 11:00 and will pick up girls in Fairmount around 11:20. Please bring your physical forms. Volleyball parent/athlete meeting on Thursday, Aug. 2 at 5:30, football at 6:00. Cross Country at 6:30. If you can't make the meeting, please contact the coach. Watch the Tristate Tiger site for game and practice schedules. Volleyball for grades 9-12 begins on August 13, practice will go from 12:00-3:00. Jr high vb begins tentatively on August 23. Time to be announced. Please share and tag others to spread the word. Reminder of the fall athlete/parent meeting on Thursday August 2nd. Volleyball at 5:30, Football at 6:00 and Cross Country at 6:30. Boys Basketball- There will be no skills camp this week or next week! Stay tuned for a possible open gym. Football team camp for 9-12th grades is next week July 25th & 26th from 7:00-8:30 in Rosholt. Arrive by 6:30 on the first day to get equipment. Please let me know if you have any questions. This weeks boys basketball schedule- Monday- Skills camp in Rosholt at 6:30 Tuesday- courts plus league at 5:30 at Fargo South! Track and field lake day will be held at coach Vrchota's cabin on Clear Lake beginning at 11 a.m. The address is 442823 North Shore Dr. Lake City, SD. Bring something to drink, a salad or chips, sunscreen, lake toys, and games. Coaches will grill for you. Be ready to learn to ski if you'd like. Hope to see you there. Reminder- Boys Basketball Skills Camp/Open gym tomorrow at 6:30 in Fairmount! Wahpeton summer league is over! There is nothing for basketball this week! Have a great week off and enjoy the 4th of July! Football team camp in Rosholt on July 25th & 26th from 7:00-8:30pm. No cost! Everyone playing football this fall is highly encouraged to attend! We will hand out equipment on the first night at 6:30. Tonight's GBB league game in Fargo at Courts Plus has been moved to 7:30 pm not 8:30. Reminder- Wahpeton Summer League tonight at 5:30 at Wahpeton Elementary School! Reminder- Boys basketball skill camp will be tonight in Campbell at 6:30! The shorts and shirts are in, so if you ordered any please bring your money to get them tonight! Reminder- Wahpeton JV league tonight at 5:30. Games will be played at the elementary school again! All volleyball players and parents: Get physicals scheduled now so players are ready to start practice on August 13! Boys Basketball- There will be no open gym tonight in Rosholt. Just leagues this week! Skills Camp/open gym is cancelled tomorrow night. We will not have the open gym at Rosholt tomorrow at 6:30. Please spread the word. Track and Field lake day will be Saturday, July 14th at Clear Lake. Reminder that the skills camp/open gym is at 6:30 tomorrow in Fairmount. Everyone 9-12 is encouraged to come! Volleyball camp begins tomorrow in Rosholt! Grades 7-12 from 9 AM to 12 noon, grades 3-6 from 1 PM- 3 PM. Pass along this reminder. 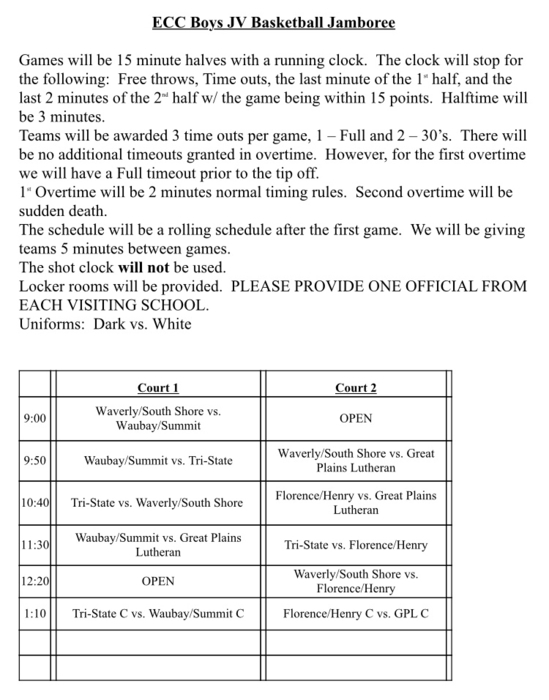 Wahpeton Summer League schedule. Everyone in 9-12 who is not going to courts plus league is encouraged to go! Be there 20 minutes early. Jerseys will be there for you. The Summer Events calendar is now available on the Tri-State Web Site under the page "Tri-State Summer Events Calendar" and on the Mobile App. Remember to click the event for a location and time! Volleyball reminder: Midwest Elite Volleyball Camp in Rosholt, June 4-6. You can register the first day, or get a form from your school's office and bring it the first day of camp. Good morning state track participants and fans. Here is information on the stadium/parking/seating/etc. TST Boys Bball players. 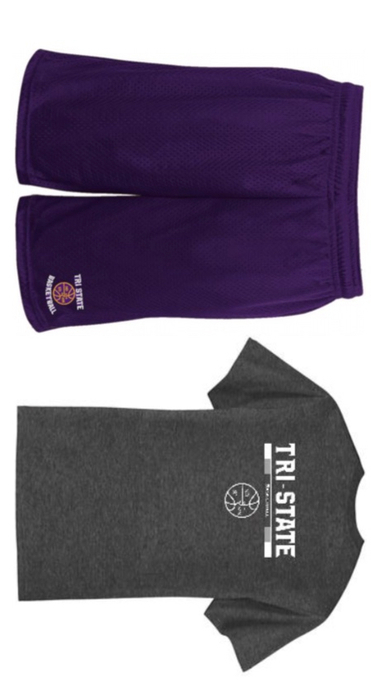 Here is a picture of the gear available this summer. Its not a fundraiser but a chance for players to get some gear. $10 for shirt, $15 for shorts, and $25 for both! Due Friday! I have the order sheet from the meeting. Text Coach Krueger if interested. The boys basketball off-season schedule is on the co-ops website (tristatetigers@k12.sd.us) I will update it the moment something changes. This will be the best way to know whats going on. Thank you! Reminders: Midwest Elite VB Camp June 4-6 @ Rosholt. Grades 7-12 from 9:00-12:00, grades 3-6 from 1:00-3:00. If you still want to sign up there are forms in each school office, you can bring forms and payment the first day of camp. Girls basketball will meet also after vb meets in Fairmont. Campbell and Fairmount look at announcements. Rosholt kids leave 9:45 am. Reminder of the football, volleyball, girls basketball and boys basketball meetings tomorrow (5/22) in Fairmount at 10:15. This is for grades 8-11. FB and VB meetings will be first followed by GBB and BBB. Bus leaves Rosholt at 9:45 and Campbell at 10:00. Tina Laurence has two hotel rooms in Rapid Thursday, Friday, and Saturday. If anyone is interested give her a call at 605-237-5885. Will only be about 60 degrees today so pack warm clothes. Monday we will compete at the Wheaton meet to gain some more experience. Some will not be able to paricipate due to the concert in Rosholt. Athletes- it is your responsibility to give your parents a heads up in case they want to come watch. Do it tonight. We are NOT competing on Thursday, May 10th. The Twilight meet in Sisseton on Friday has been moved up to 1 pm for field events and 2 pm for running events. Field events start at 4:00 and running events at 5:30 for the Sisseton Twilight meet Friday. Field events start at 4:15 and running events begin at 4:45 for the Wheaton JH meet on Thursday. There will be JH practice in Rosholt tomorrow. Leave times for tomorrow (Milbank): 11:15 Campbell 11:35 Fairmount 12:00 Rosholt Remember to talk with your teachers. Reminder: No JH practice today. Today leave times are switched to 12:45 from Campbell and 1:05 from Fairmount. Rosholt is still 1:30. Reminder that pictures are tomorrow. Pack your jerseys and fill out your order forms this evening. We are back into the Groton meet on Tuesday, April 24th. Team pictures are Monday, April 23rd at practice. No meet in Wheaton on Tuesday, April 24th. We are trying to get into the Groton meet that day. Stay tuned. The meet tomorrow in Webster has been cancelled. The Junior High meet in Wheaton on Monday, April 16th has been moved to Thursday, May 3rd. The meet in Aberdeen tomorrow has been cancelled. We will still have practice if we do not have a meet tomorrow. Athletes: Remember to tell your families about Friday ASAP in case they would like to come watch. Will be too sloppy and muddy for sledding tomorrow. Bring warm clothes to run outside. Practice today will be held in Fairmount due to a water main break in Rosholt. JH will compete in Wheaton on May 3rd. Update: We will compete in Wheaton instead of going to tge Groton Kiwanis meet. There has been a mix up and we will not be competing in Aberdeen on Friday. If another team drops out of the meet we have a shot at going, but as of now we are out. Reminder: the online store is open until mindnight. The region track meet has been moved from Groton to Clark. That being said, we will try to switch our the Groton Kiwanis meet back to the Wheaton meet. Stay tuned. April 13th we will be heading to the NSU indoor track to compete in the morning or afternoon. Will relay the details as I get them. The Tri-State meet on Thursday, April 12th has been cancelled. The track meet in Milbank on Tuesday, April 10th has been cancelled. The softball games scheduled for Tuesday 4/3 in Northern Cass and Thursday 4/5 in Hillsboro have been postponed. No reschedule dates are set but they will be posted if they become available. The alumni basketball game today is still on! Gym will open at 1, girls start at 2 and boys to follow! Come join us for the fun filled afternoon! The meet in Milbank on April 5th has been cancelled. For the Randy Huether indoor meet in Wahpeton today Rosholt athletes will dismiss at 2 and depart at 2:10. Fairmount will dismiss at 2:20 and Campbell will pick us all up in Fairmount at 2:30. 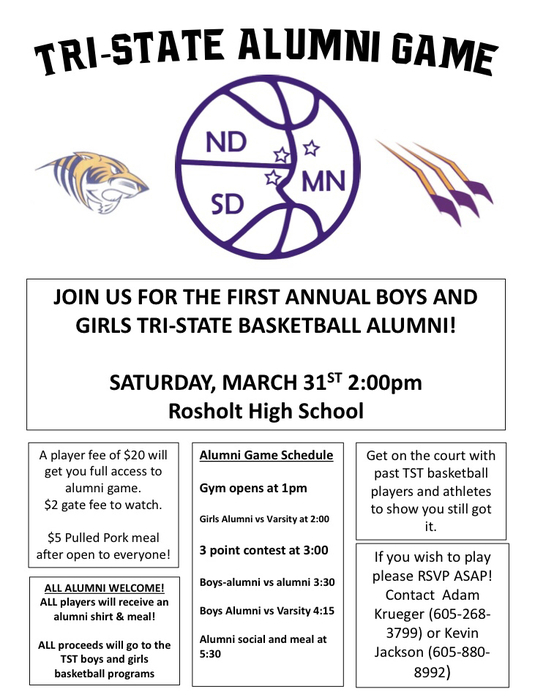 Don’t miss the alumni game this Saturday in Rosholt. Girls start at 2 and boys to follow. We will make teams on Saturday. Come lace up or watch this fun filled afternoon. Please RSVP as soon as you can. Any questions please contact Adam Krueger or Kevin Jackson. No junior high practice Tuesday, March 27th. They are invited to come watch the varsity meet if interested. 1st Annual Basketball Alumni Game! Open to any alumni from the 3 schools! Contact Adam or Kevin if you are interested. There will be a basketball meeting in Fairmount before dinner tomorrow. Transportation will be provided from Rosholt and Campbell around 10:50. Bring jerseys, practice jerseys, and binders if you still have them. We will vote for season awards. There will be a Track and Field parent/athlete meeting in Fairmount on Sunday, March 11th at 7 p.m. Athletes looking to improve speed, strength, and endurance encouraged to join. Go Tigers! Tri-State Boys and Girls will be hosting the 1st Annual Alumni Game on March 31st. Open to any alumni from the 3 schools. More details to come. Also, a special thank you is in order to our two seniors, Abel and Ben. Thank you for everything. We’re going to miss you both next year. The boys season sadly came to a close last night when they lost to Lisbon. It has been a great season, everyone! The Tiger Boys will play Lisbon in round one of the ND Region 1 BBB Tournament in Rosholt starting at 7PM. The game will also be broadcast on Q101.1, although due to region rules, will not be live streamed. Come cheer on the boys tonight at 7! Gameday in Wyndmere today. Bus will leave campbell at 3 and busses will leave from Rosholt and Fairmount at 3:15. JV & Varsity practice in Campbell tomorrow. No C-squad practice tomkrrow. Everyone will have practice Wednesday. I will pick up Fairmount kids on way to Campbell tomorrow! Watch the Tigers GBB Region 1 Playoff Game streamed live against Hankinson tonight. Click the link below to watch live starting at 7 PM. https://www.youtube.com/channel/UCiKCb-VKScG8ra7G_sklPiQ?disable_polymer=true. 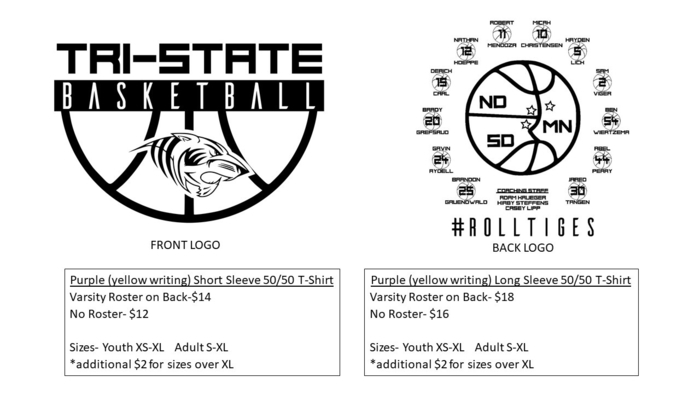 Tri-State Basketball shirt order is due Thursday night. You have option to get Varsity Boys or Girls Roster on the back if you want something on the back. Contact Coach Krueger or a member of the Boys Basketball team if interested! GBB Practice is in Rosholt today after school. Girls play first region game against Hankinson away at 7pm. You must believe to succeed!!!!! Basketball practice for everyone in Fairmount after school today! Rememeber T-shirt sales are due tomorrow. 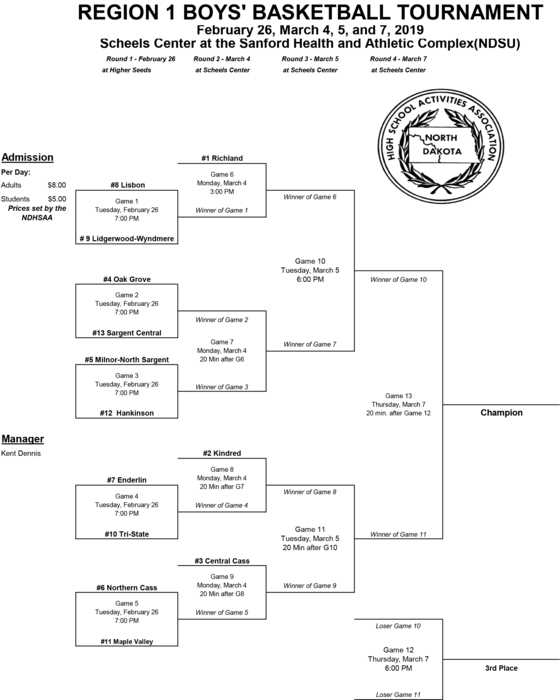 Tigers GBB will be playing in the Region 1 Playoffs in Hankinson on Thursday 2/15 at 7PM. Come cheer on the Tigers Girls Thursday night! The Tri-State Boys Basketball team will be selling shirts for regions. 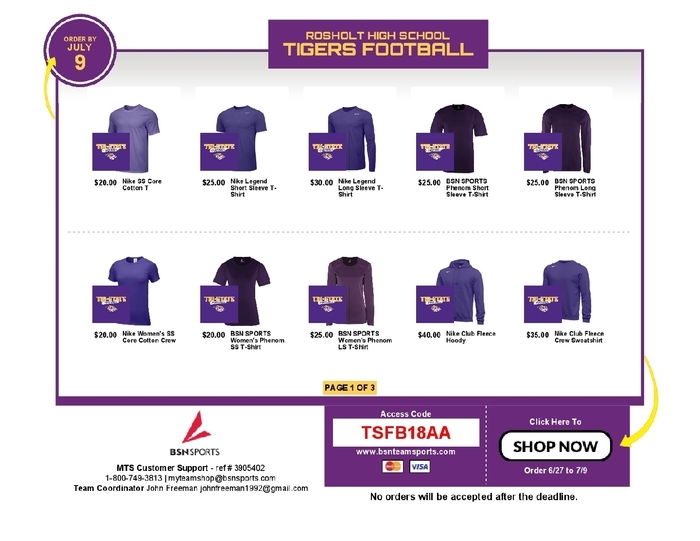 They will be purple with yellow writing and have an option to have the Varsity roster on back. Orders are due Thursday. Contact Coach Krueger or any Varsity player to order! JV/V practice tomorrow after school in Fairmount. C-Squad will practice Wednesday after school. Abel Perry grabbed 24 rebounds to go along with the team-high 26 points while Micah Christenson put up 21 points! The boys game tonight will be streamed on you tube. Search Sargent Central Cadets. Great efforts with two big wins last night for the Lady Tigers. Monday Feb 12th Waverly /South Shore in Rosholt JV at 6:00 varsity to follow. There WILL be a C squad Game at 4:45pm with Wheaton before the JV game in Rosholt. The Lady Tigers beat Wyndmere-Lidgerwood 64-57. Kailey had an outstanding night with 25 points! Basketball practice today at Rosholt for everyone! Proud of the girls efforts last night in Richland. Playing all 4 quarters hard. Lets keep it going the rest of the week!! Lady Tigers pulled off a win against Richland Colts 46-42. Taiha was leading scorer with 12 points and Kailey close behind with 11. Practice tomorrow in Rosholt for JV & V. No C-Squad practice tomorrow because there are no C-Squad games this week. 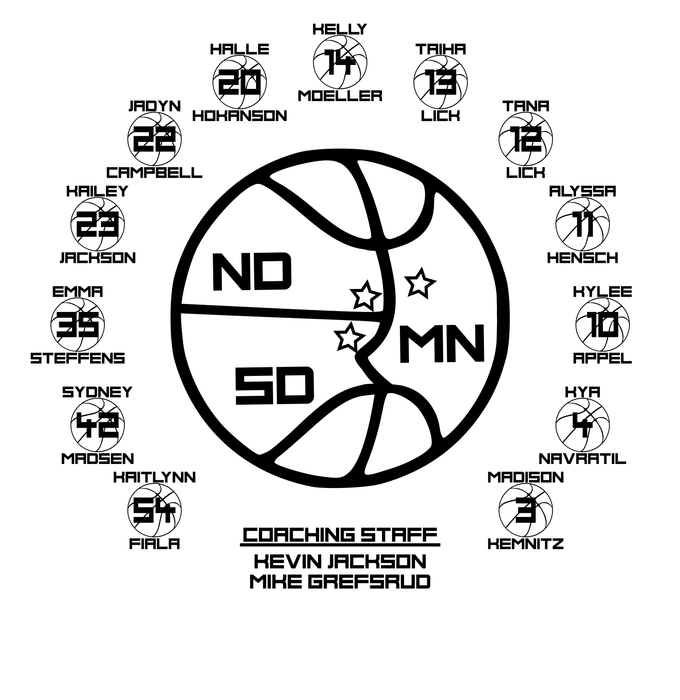 Today girls will play at 6pm against Hankinson at NDSCS. Bus will leave Rosholt at 3:40pm. Today: C-Squad No Practice JV/V Practice in Fairmount after school! Game tomorrow @ Northern Cass. C-Squad will play at 4:45 and JV/V to follow. Bus will leave during school do come to school prepared for game! SCHEDULE CHANGE! We will practice in Fairmount today! I apologize for short notice! GBB practice will be in Rosholt tomorrow wed 31st not in Fairmont. Boys will be in Fairmount, Girls in Rosholt Wednesday. Correction! Practice will be in Fairmount tonight. There is a Jr Hi Boys game in Campbell tonight! Big Region win last night! Lets keep it rolling. Also big shout out to parents. Thank you guys for everything you do! Reminder we practice in Campbell tonight. Great Win last night girls at Sargent Central. Lets keep the win streak going next week Tuesday against Lisbon!!! Reminder game on Monday vs Enderlin in Campbell. C-squad starts at 4:45 and JV/V tk follow. Its also parents night on Monday! Reminder game on Monday vs Enderlin in Campbell. C-squad starts at 4:45 and JV/V tk follow. Its always parents night. Great game varsity and jv tonight!! Both teams played awesome! Practice in Fairmount Wednesday. Great game tonight boys! Was a fun night. We practice in Campbell tomorrow after school! BBB game tonight in Rosholt vs Milnor/North Sargent. C team starts at 4:45 and JV & V to follow! Congrats Girls on OT win over Northern Cass last night!! Game tomorrow night vs Oak Grove. Game is in Rosholt. C squad starts at 4:45. JV & V to follow! Fairmount and Campbell players listen to announcements for departure time. COPYRIGHT © Tri State Athletics 2019. ALL RIGHTS RESERVED.